March 1, 2019 Warframe’s Hildryn is set to debut very soon. 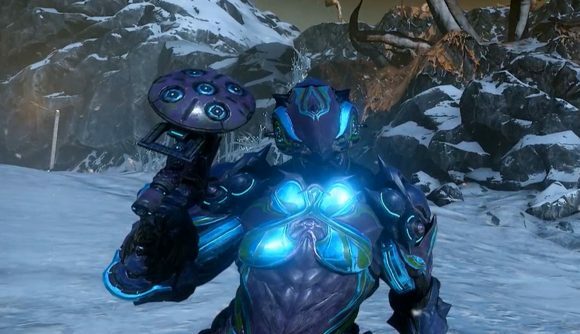 Warframe’s latest frame arrives later this week, and while we’ve known what Hildryn will be able to do for a while, we’ve now had our first proper look at the new arrival. In a tweet last night, which you can check out below, we’ve seen Hildryn in action for the first time. Warframe developer Digital Extremes has wrapped up its latest developer stream, and this one brings a soft release date for the next frame. Hildryn is coming very soon – next week, in fact – and she’ll be accompanied by the first step of the melee rework. It should be noted that those melee changes are about a month behind their original “next week” plan, but the developers framed that release in much more uncertain terms than this one. In addition to Hildryn and the melee changes, next week’s update will also include a new two-handed melee weapon called the Tatsu. It’s a major update all around, but it come without at least one long-awaited addition – the Gas City rework is closing in, but it’s still a bit further off than these more immediate additions. If you missed Hildryn’s proper unveiling, she’s got a special gimmick in that her shield pool doubles as her energy pool, so you’ll need to pay cautious attention to your resources here. You’ll still be able to grab energy pick-ups, but they won’t just increase the pool – they’ll also remove the shield recharge delay. Introducing Hildryn, the domina of armament. Her passive puts shield gating on both base shields and overshields, and her dash will even summon additional shields for you as you dodge attacks. Yes, it’s a lot of shields. Today’s devstream, available above, gives a look at plenty more features in development, though many of them are pretty early in development. You can get a look above, but the short version is that you can expect a major rework of the abilities screen and continued refinements to the movement system. Oh, also, there’s a look at Wisp’s unique animation system at about 30:00 – it’s intense.